Florida State is the oldest institute of higher education in the Sate of Florida. The first administration building was built on “Gallows Hill” in the wild frontier of Territorial Tallahassee. The school has had many names over the years from the 1850’s Seminary of the Suwanee and the Florida State Seminary. During thee Civil War it was the Florida College and Military Institute. 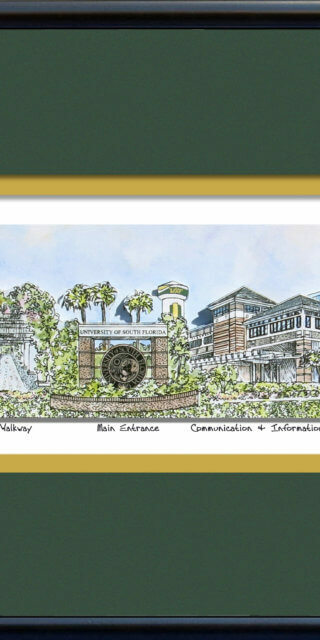 In 1883 it became the University of Florida – Gasp! All male students were sent to an all male school in Gainesville called the University of the State of Florida. The female students were now at Florida State College for Women which was the third largest womens college in the U.S. Florida State University ended its segregation of students by gender when GI’s returned after WWII. 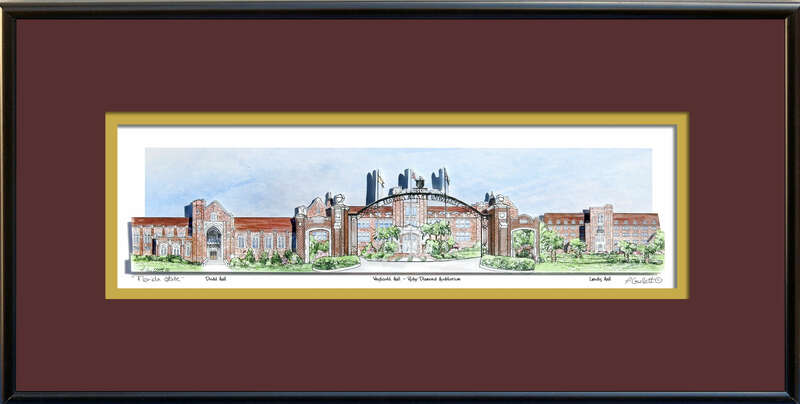 The buildings depicted in the Florida State artwork are Dodd Hall, Westcott Hall & Ruby Diamond Auditorium, and Landis Hall. 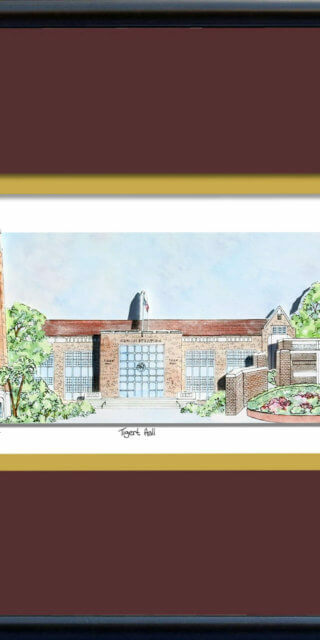 Westcott Hall is the third building that has stood on “Gallows Hill” and houses the Ruby Diamond Auditorium. Landis Green is a gathering place for students and has the distinction of being the originating site of the 1970’s fad of “streaking.” The mascot name of the Seminoles was chosen by the students in 1947 and is officially sanctioned by the Seminole tribe of Florida. Go Noles!